I get very restless if I spend even a day not cycling. I don’t know why, but that’s what happens. When I’m not traveling, I regularly skip gym days. I don’t stick to routines. I don’t set an alarm. But when I’m out on the road, suddenly everything is regimented, and anything outside of my careful routine strikes me as almost frivolous. I wake up at 6:30am sharp pretty much every day. I’m on the road by 8am at the latest. Cities sort of become obstacles, because they break my routine. Also, hostels and other places to stay are close to tourist sites and not necessarily good grocery stores at which to restock on food. If I could just camp outside grocery stores, that would be great, but those tend to be high-traffic places where people would (gasp!) stop by my tent and question why I’m biking across Uzbekistan alone. The answer is supposed to be ‘because I like it’, right? The conviction has been lacking behind those words in recent weeks. Over tea and kebabs in Aktau I said it with a smirk and an abundance of swagger. 100km outside Bukhara I screamed it through tears into a suffocating desert headwind. Fortunately, as I rode for the Tajik border, conditions were about to improve dramatically. If they hadn’t already improved dramatically enough. The Registan, in Samarkand, at sunset. As I rode into Samarkand, I was steeling myself for two, maybe three days off the road to recover from Uzbekistan. I also wanted to give my tires (again with the freaking tires) some time to arrive in Dushanbe without burning time on my Tajik visa, which I had yet to set a start date for. I knew it would end up feeling like an eternity, so I planned some tasks for me to do. Fix my tent somehow, buy a toothbrush and clean my zippers, find some new stakes (more like wander around to demolition sites and look around for thin rebar), stitch some other things that had recently fallen apart. Buy food. Maybe go to a tourist restaurant, overpay for something that vaguely resembles a burger, and fill up part of a blog post with my thoughts on Uzbek burgers. I told myself I also needed to go see the city’s sights and take some pictures, but then the question was whether or not I should I take my bike with me. If I took it, I’d be done with the sights in a half a day at best. But if I didn’t take my bike, then I’m without the one item that pushes me over the threshold of approachability for random Uzbeks, which is always kind of neat. After a month of desert, my face has fixed itself into a nasty scowl, my beard is unkempt, and I my clothes are saturated with the freshest scent of the 2018 fashion season: propane. Without the bike, I’m honestly sort of unapproachable. The thing that finally tipped the scale: If I take the bike, I can’t go inside anything, and I didn’t go into anything in Bukhara. OK, it was decided. I would walk to the tourist sites, and go inside a mosque to get my culture fix. Inside the Registan. I definitely paid the entrance fee. So I walked 30 minutes over to the Registan, realized the Registan had a massive entry fee that definitely wasn’t in my that-type-of-morning budget (25 cents. Lol. ), and just took some pictures from outside. OK, that’s done. On to the next thing. Voice 1 (impatient) and Voice 2 (patient) from the Kazakhstan post had returned in force. Central Asia is a small, small place. There are two hostels in Samarkand and one in Bukhara. These places cater to the same types of people, so chances are high that you will bump into the same people again, even if you aren’t traveling the same way. This might be an exaggeration, but I think by the time I left Samarkand, I had either met or was aware of the presence of pretty much every other American tourist between the ages of 20 and 30 across Bukhara, Samarkand, and Tashkent. As it turned out, someone I had met late one dark night over strawberries in Bukhara had naturally moved on to Samarkand next, and I had been discovered. Long story short, the next two days were far less painful than anticipated. A wonderful sunny day spent people watching outside the Registan, realizing how starved I had been for company of another American. A second, much rainier day spent in visiting Shaharisabz. Put together, a much-needed reprieve from my month of isolation in the desert. Voice 1 and Voice 2, which really only exist when I have nobody to talk to but myself for days on end, took a hike and let me hang with my new friends. One day after that, I finally succumbed to my impatience. I applied for my Tajik e-visa (a very streamlined process, obtainable within hours), loaded up on food, and set off for the border. The Penjikent border 45km from Samarkand only opened a month and a half ago for foreigners. It literally happened as I was nearing Baku. In Bukhara, I had to finally make a decision whether or not to go for the newly opened border or the one I had previously planned to use at Denau. I ended up making my first audible of the trip and went to Penjikent. The President might have said hello too, but he’s been in office since 1994 so he’s probably greeted many cyclists already. Rainy day, but happy to be in Tajikistan. It was a good decision. The Zerafshan Valley in Tajikistan has not seen many cyclists (or tourists for that matter) due to the closure. As I went through, I suddenly realized that I was in a place where I was probably one of the first, if not literally THE first to come through this stretch of road on a bike in many years. Did anyone else cycle from Penjikent to Ayni, Tajikistan between March 1 (the opening) and April 19 of 2018, or was I the first? It was gorgeous, free of almost all traffic, and the road was in perfect shape. There are places to change money in Penjikent, despite various banks in Tajikistan regularly going bankrupt. I was probably greeted by the most people I’ve ever been greeted by on a stretch of road. It was almost a constant stream of, if I’m honest, pretty delicate hand-over-heart-rather-than-waving interactions with the residents of an incredibly traditional region of Tajikistan. Also, one very obvious cussing out in Tajik, but that was only once. Greetings came from people of all ages (uncommon), both genders (even more uncommon), and all walks of life (religious people, farm hands, school children, etc.). Everyone wanted in on the fun to welcome me to Tajikistan. Morning in Tajikistan and time to go ride. Now introducing, as I get higher, the color Red! The riding was spectacular too, and I was feeling great. Samarkand to Dushanbe via Penjikent is one long, 250km mountain pass through the Fann Mountains in Northwest Tajikistan working up to the Anzob ‘Tunnel of Death’ at about 2650m elevation. Or at least it used to be. 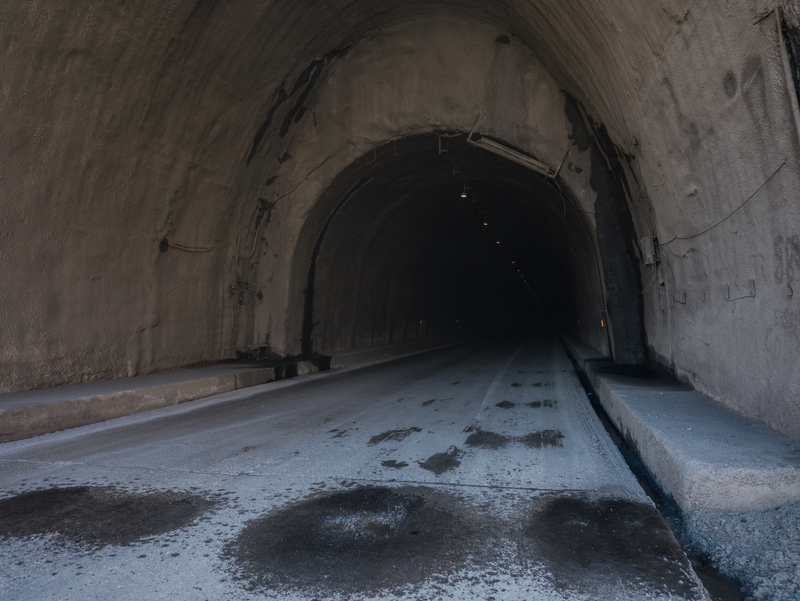 Prior to 2014, the tunnel was an unlit, unventilated, 8km deathtrap, with exposed rebar, and trucks making dangerous passes and generally going too fast. It is still sort of a mess, but the owner of the hostel I’m staying at in Dushanbe assures me that it used to be oh so much worse. There are videos online of the tunnel from when it was in worse shape if you want to experience the madness of what was. On the second day from Samarkand, rolling hills gradually gave way to intense, steep switchbacks, with trucks moving only about twice as fast as I was. The rain and clouds parted, and I made OK time moving up to the base of the final climb. I camped at the edge of a switchback, and finished the climb the next morning. I didn’t know how my body would respond to climbing again after so long in Uzbekistan, so I budgeted about four or five days to make this 300km ride through the mountains. I was suddenly in a position, at the top of the pass, to make it easily in three. I was tired, but a 70km descent into town awaited me, and it was only noon. Feeling great to be at the top of the pass, but you can start to see the tunnels lurking way down in the background. You will be tired from the ascent, but know that at the top of the pass, your work is far from done. The first tunnel is the Anzob tunnel, and you should probably hitch that one. But after that, along the descent, there are about 35 (no typo) more unlit (save for one longer one) tunnels of various lengths. There is traffic, trucks and cars. However, all of the tunnels have walkable elevated pathways along the inside walls, and small, usually walkable gravel paths along the outside. The outside paths have no guardrails, and may be snowy. Please just be very careful about the choices you make. Tunnels are so, so dangerous. Ok, so I’m going to claim that the camera distorts this picture so that the path around the outside of this tunnel looks much more dangerous and sloped than it is. It is flat. After the pass, the road sharply, then gently descends towards Dushanbe along the beautiful Varzob River, a tourist destination for local Tajiks. After the tunnels, I was through my first big Tajik challenge, with many, many more to go. That pass, at 2660m, as great as it felt, was still about 2000m in elevation lower than where I’m headed. Pleasant, and gentle riding further down the pass. Nearing Varzob. I am now in the notorious Green House Hostel in Dushanbe, where many cyclists usually stay. However, it’s still April and there’s nobody here yet. Not a surprise, though. I haven’t seen anyone else in the 3,000km I’ve cycled to this point, so I don’t know why I was expecting anyone to be here. I had a hope that maybe I had just happened to miss ‘everyone’ who was cycling across Uzbekistan in April, but apparently that’s not a very popular thing to do. I know one person is a few days behind me, and he’ll arrive in a few days. I’ll force myself to take a few days and enjoy this paradise of strong wi-fi and wait for my tires (it’s always the tires). It’s still too cold and unpredictable to go into the Pamirs this week with my current gear anyways. I’ll go closer to May, as painful as it is to my impatient side to accept that. 3,000km in two months, with plenty of time off the road to get here. 2,000km last month, which is great progress. That’s as long as any of my previous tours, and it’s cool to feel this great and fresh after that time. Patagonia was 3,000, Southeast Asia was 2,750, and I was pretty drained after both. I’ve dropped this short post here in anticipation of the next stretch of road in front of me. Dushanbe is sort of the end of ‘Leg 2’ of this trip, and ‘Leg 3’ is where things get really weird. The Pamirs await. Oh, one final thing. The burgers in Uzbekistan are… pretty bad. I’m glad to read about the tunnels after you went through them. It’s fascinating to read about all this. How will you ever adjust to “normal”life with good burgers?